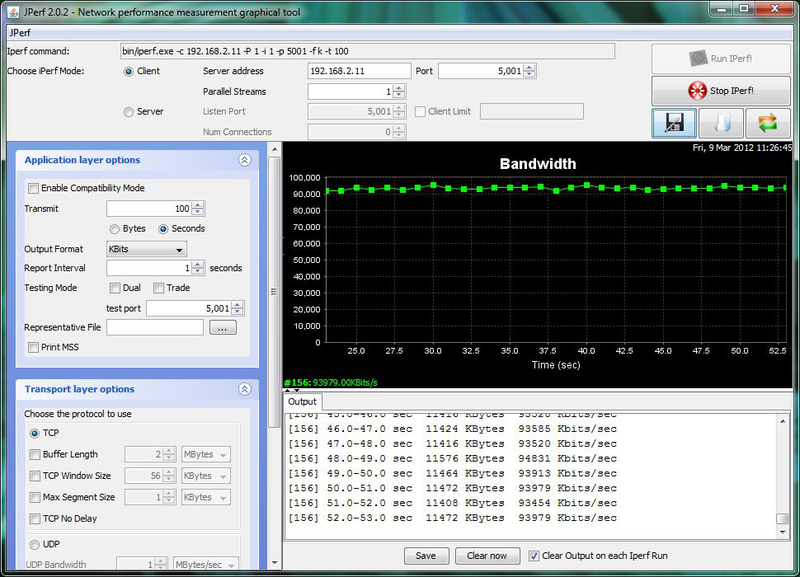 Iperf is a utility for measuring maximum TCP and UDP bandwidth performance. It can be used to chart network throughput over time. For example, it can be used to test the speed of different types of shares to determine which type best performs on the network. FreeNAS® includes the Iperf server. To perform network testing, install an Iperf client on a desktop system that has network access to the FreeNAS® system. This section demonstrates how to use the xjperf GUI client as it works on Windows, macOS, Linux, and BSD systems. Linux and BSD users can install the Iperf package using the package management system for their operating system. To start xjperf on macOS, Linux, or BSD, unzip the downloaded file, cd to the unzipped directory, type chmod u+x jperf.sh, and run ./jperf.sh. Once the client is ready, start the Iperf server on FreeNAS®. Beginning with FreeNAS® version 11.1, both iperf2 and iperf3 are pre-installed. To use iperf2, use iperf. To use iperf3, instead type iperf3. The examples below are for iperf2. The daemon process stops when Shell closes. Set up the environment, for example, shares configured and started, before starting the Iperf process. From the desktop, open the client. Enter the IP of address of the FreeNAS® system, specify the running time for the test under Application layer options ‣ Transmit (the default test time is 10 seconds), and click the Run Iperf! button. Figure 26.1.1 shows an example of the client running on a Windows system while an SFTP transfer is occurring on the network. When testing is finished, either type killall iperf or close Shell to terminate the Iperf server process. The following command displays the available options for performing tests with the netperf command. The Netperf Manual describes each option in more detail and explains how to perform many types of tests. It is the best reference for understanding how each test works and how to interpret the results. When you are finished with the tests, type killall netserver to stop the server process. For these options taking two parms, specifying one value with no comma will only set the first parms and will leave the second at the default value. To set the second value it must be preceded with a comma or be a comma-separated pair. This is to retain previous netperf behavior. FreeNAS® ships with IOzone, meaning that it can be run from Shell. When using IOzone on FreeNAS®, cd to a directory in a volume that you have permission to write to, otherwise an error about being unable to write the temporary file will occur. Before using IOzone, read through the IOzone documentation PDF as it describes the tests, the many command line switches, and how to interpret the results. Type the following command to receive a summary of the available switches. As you can see from the number of options, IOzone is comprehensive so it can take some time to learn how to use the tests effectively. If a visual representation of the collected data is preferred, scripts are available to render IOzone’s output in Gnuplot. Watching ARC hits/misses and percentages will provide an indication of how well the ZFS pool is fetching from the ARC rather than using disk I/O. Ideally, there will be as many things fetching from cache as possible. Keep the load in mind while reviewing the stats. For random reads, expect a miss and having to go to disk to fetch the data. For cached reads, expect it to pull out of the cache and have a hit. The FreeBSD ZFS Tuning Guide provides some suggestions for commonly tuned sysctl values. It should be noted that performance tuning is more of an art than a science and that any changes made will probably require several iterations of tune and test. Be aware that what needs to be tuned will vary depending upon the type of workload and that what works for one person’s network may not benefit yours. Table 26.4.1 briefly describes the columns in the output. The ZFS tunables require a fair understanding of how ZFS works, meaning that reading man pages and searching for the meaning of acronyms is required. Do not change a tunable’s value without researching it first. If the tunable takes a numeric value (rather than 0 for no or 1 for yes), do not make one up. Instead, research examples of beneficial values that match your workload. The output will indicate the old value followed by the new value. If the change is not beneficial, change it back to the original value. If the change turns out to be beneficial, it can be made permanent by creating a sysctl using the instructions in Tunables. When tw_cli is entered in Shell, the prompt will change, indicating interactive mode is enabled where all sorts of maintenance commands on the controller and its arrays can be run. MegaCli is the command line interface for the Broadcom :MegaRAID SAS family of RAID controllers. FreeNAS® also includes the mfiutil(8) utility which can be used to configure and manage connected storage devices. See the zdb(8) manual page for more information. 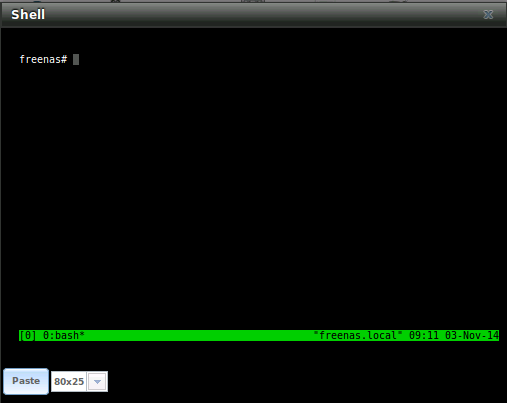 To start a session, simply type tmux. As seen in Figure 26.8.1, a new session with a single window opens with a status line at the bottom of the screen. This line shows information on the current session and is used to enter interactive commands. If Shell is closed while tmux is running, it will detach its session. The next time Shell is open, run tmux attach to return to the previous session. To leave the tmux session entirely, type exit. If multiple windows are running, exit out of each first.